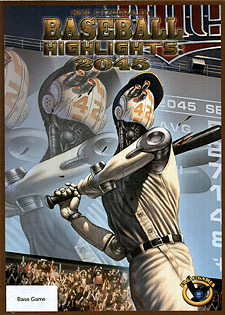 WELCOME TO THE WORLD OF BASEBALL HIGHLIGHTS 2045! American baseball was on its last legs as a spectator sport. Football had become the predominant national pastime. That is until the year 2032. The year baseball decided to revolutionise the game and regain the throne! Starting in 2032, baseball games were shortened to 6 innings. Pitchers were encouraged to have bionic arm implants to improve their pitching. These Cyborgs, or 'Borgs as they are now affectionately known, were immediately popular and soon ruled the league. In 2041 Robotic players were introduced to get more offense back into the game. These Robots were similar to designated hitters in that they were only used to bat and did not field. However, recent reports indicate fielding 'Bots are on the way. Now, in 2045 human players are still in the game and known as Naturals. They are the best fielders by far but are sorely challenged when it comes to hitting and pitching. Some Naturals have learned to hit by swinging before the pitcher starts his windup, which gives them a chance to hit the ball. Although it is very hard for a Natural to get into the league, those that do are very popular. Many Naturals have named themselves after the great players of pre-2032 baseball by taking a first and last name borrowed from different star players of the past. The fans love them and their presence on the team ensures good attendance and good revenue! The fans are energised and root fanatically for their new favourites - be they 'Bots, 'Borgs, or Naturals! Baseball Highlights 2045 is normally played with two managers heads up. Rules are also included for Tournament, 3-player and Solitaire Play. One game box contains enough components for 4 players to play simultaneously. By combining more boxes, you can easily host tournaments of 8, 12, 16, or more players!